200 electric cars will be available to rent on a time-sharing basis in the Optics Valley of Wuhan on March 17, marking the city usher in a new era of sharing economy. After downloading the app"Gofun出行",users will register on their phone using their personal identification and driver’s license. After authentication, which takes just one hour, users will be given GPS-based directions on how to locate their rental car, which will honk upon their arrival. By using the Gofun app, Wuhan residents will be able to rent an electric car at a rate of 1 yuan per kilometer and 0.1 yuan per minute with a deposit of 699 yuan. It was introduced that Gofun will put at least 1,000 cars into the market by the end of this year. 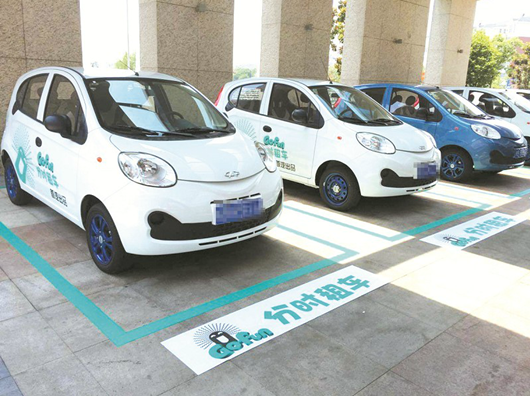 In addition to Gofun, the local platform for car sharing, launched by Wuhan Urban Construction Investment & Development Group, State Grid and Wuhan EV Demonstration will be operational and now 300 (1,500 by the end of this year) new energy cars have been put into 152 designated locations in the Optics Valley and Zhuankou.